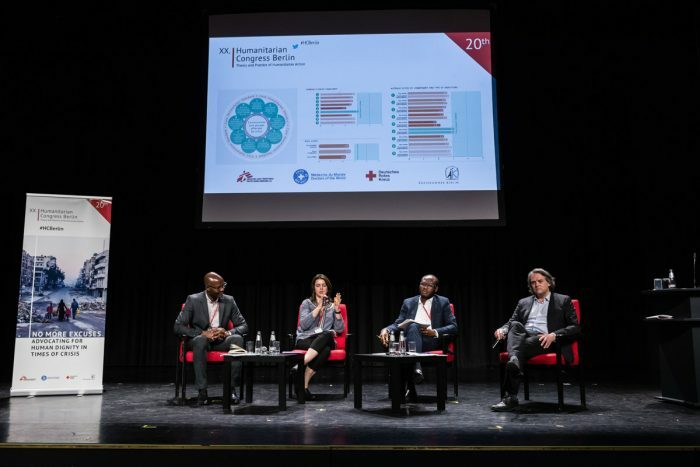 On 4th & 5th October, the CHS Alliance took part in the 20th Humanitarian Congress in Berlin. Focusing on topical issues such as migration and the safeguarding crisis, participants discussed how to best support crisis-affected people in a polarized political environment. 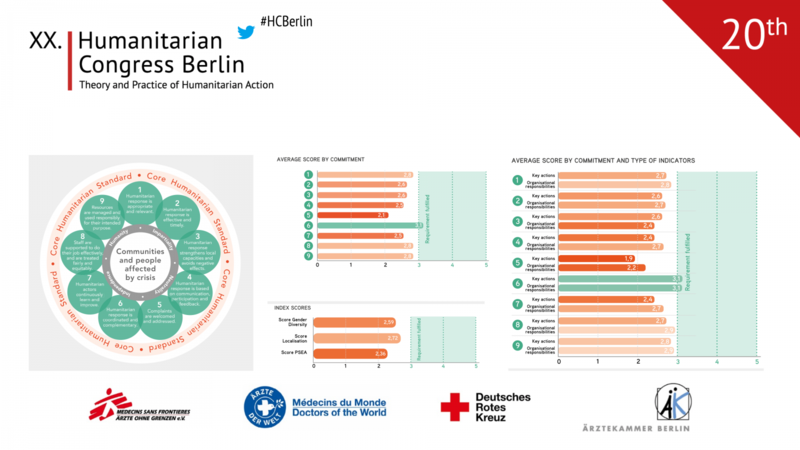 The Humanitarian Congress Berlin is a forum to analyze and discuss the theory and practice of humanitarian action. Each year, it brings together over 800 leading and emerging experts from around the globe to share experiences and knowledge in an international and multidisciplinary setting. This year the Congress discussed current political trends and their implications for the people at the core of humanitarian work. Bonaventure Sokpoh, CHS Alliance’s Head of Policy, Advocacy & Learning, and Shama Mall, Deputy Regional Director of Programs and Organizational Development at Community World Service Asia (CWSA) and Board member of the CHS Alliance, both participated in a panel discussion focusing on humanitarian accountability. It was an opportunity for both of the members to advocate for the CHS and the Core Humanitarian Competency Framework. Currently there are so many different quality and accountability standards available for the sector, and in many cases, they really changed the way we respond to emergencies, but the question remains whether we are doing enough in practice,” Shama said. Specifically, she would like to see changes in organisational behaviours and attitudes to ensure a more meaningful engagement at the community level: “staff should be able to demonstrate accountability in their day-to-day activities.
. She also warned that, based on her experience, in certain cultures managers find it hard to demonstrate personal accountability or even hold their own team members to account, as people don’t want to get into confrontational situations. Another problem is that managers also find it difficult to admit that they have gaps in their programming. I believe that the Core Humanitarian Competency Framework (CHCF) can help achieve these behavioural changes. This framework helps to look at the core competencies that are needed in an organisation to promote a more accountable culture. Bonaventure promoted the Alliance’s flagship publication, the Humanitarian Accountability Report (HAR), which was recently launched and examines how change happens in the humanitarian sector. he said, backing up Shama’s earlier comment. Real change happens when commitments translate into practice on the ground. once an organisation has been verified against the Core Humanitarian Standard on Quality and Accountability (CHS), we are able to see its strengths and weaknesses, where we need to put our efforts to make further improvements. The aggregated verification data collected so far shows that the aid sector needs to make progress with regard to its application of Commitment 5 of the CHS (complaints mechanisms), as well as Commitment 4 (communication with communities) and Commitment 7 (learning from experience). It’s good to have the data, but we also need to hear the voices of the affected people, and that’s the reason why we started to work together with Ground Truth Solutions in Chad. The first results of the perception survey show discrepancies between the perception of aid workers and crisis-affected populations. For example, while aid workers feel confident in their targeting, respondents within the crisis-affected population were much less certain, with only 34% considering that those most in need are reached.